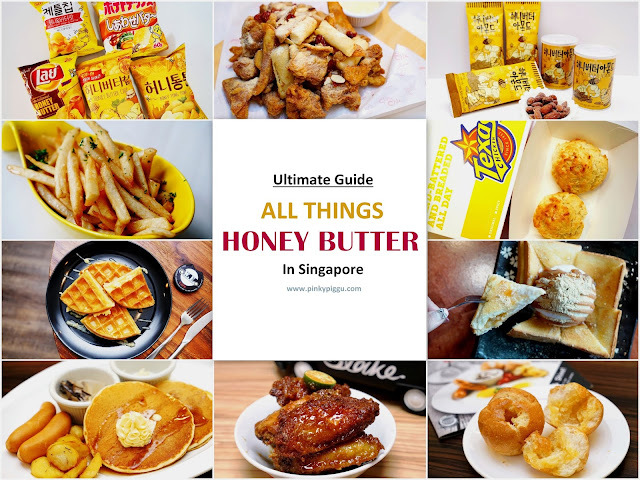 PinkyPiggu: Ultimate Guide To All Things HONEY BUTTER In Singapore! Chips, Nuts, Fried Chicken, Fries, Waffles & More! Ultimate Guide To All Things HONEY BUTTER In Singapore! Chips, Nuts, Fried Chicken, Fries, Waffles & More! HONEY BUTTER! The craze that swept through Korea and beyond. The sweet-savory combination that seemed to have an inexplainable magical power to make anything insanely yummy! Managed to get the popular Honey Butter Chips already? If those chips are not sufficient to fully satisfy your craving for honey butter-flavored deliciousness, here are MORE! Chips! Nuts! Fried Chicken! Fries! Waffles and all things Honey Butter! Though the variety is not as wide as what we can find in Korea, the available offerings on this little island of ours are still pretty decent. Let's get on this quest for All Things HONEY BUTTER In Singapore! Related Post: HONEY BUTTER CHIPS! Where To Buy The Popular Snacks In Singapore? Find Out Here! Fried chicken takes centerstage at Texas Fried Chicken, but if there's an award for best sidekick ever, the winner could possibly be these Honey Butter Biscuits! 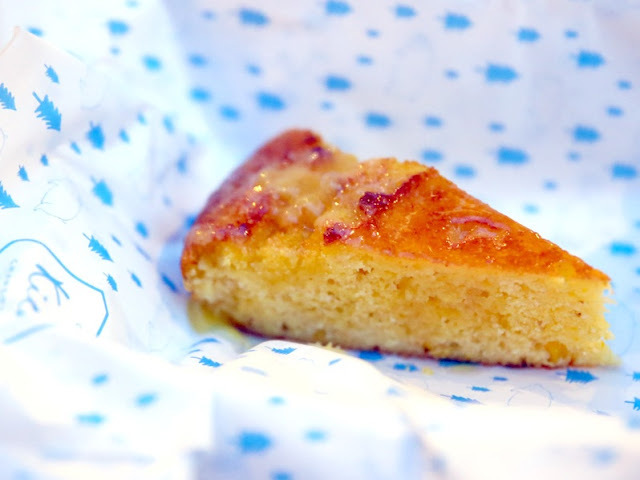 Each biscuit is handmade and glazed with Texas' signature sweet and savory honey butter. Warm, moist, crumbly, flavorsome to bite, and utterly enjoyable! If almonds are not enough, there are also cashew nuts in honey butter flavor! Nut lovers must be so happy! Glazed with honey butter and generously showered with honey butter seasoning powder, the boneless chicken chunks are buttery, sweet, savory all at once. Amazingly addictive! Accompanying honeyed garlic mayo dip is provided as well, but the taste of the chicken is already good enough on its own. Intense in buttery flavor with a distinct note of honey, the formidable pairing of sweet and savory has captured the affections of numerous tastebuds. 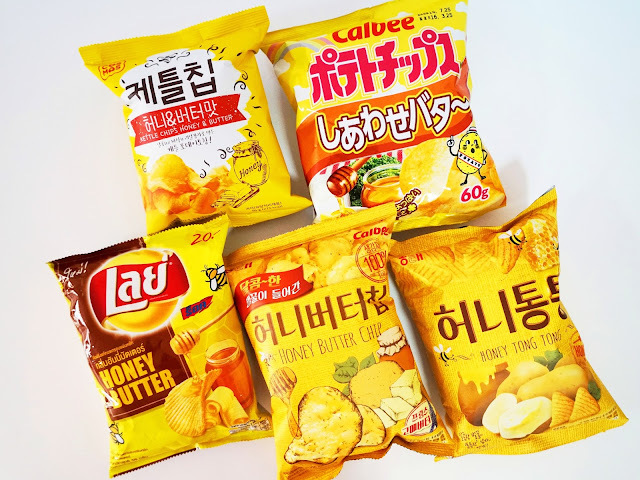 Though Calbee launched the chips in Japan in 2012, it did not take off in terms of popularity until the collaboration with Haitai saw its debut in Korea 2 years later, creating a honey butter craze that swept across Korea and beyond. Extremely well-received, it is said that even getting the Haitai-Calbee Honey Butter Chips in Korea itself can be quite a challenge.Where can you find it in Singapore then? PinkyPiggu scoured the island to find these Honey Butter Chips for you! Various brands offering this addictive delights include Calbee, Haitai-Calbee, Kettle, and Lays. Read: HONEY BUTTER CHIPS! Where To Buy The Popular Snacks In Singapore? Find Out Here! The well-loved family dining restaurant has Honey Butter Ciabatta Roll on their breakfast menu! These crusty ciabatta rolls are freshly baked daily and filled with housemade honey butter cream. Included as part of Swensen's Sunrise Omelette or sunny-side up breakfast set, but if you can't get enough of it, do ask for more at a top-up price of $3 for 2 pieces. Camp Kilo Charcoal Club, the latest roast joint to hit town! Besides hearty meats such as crispy pork belly, pork ribs and lechon, one can also expect an array of side dishes, including the Corn Bread with Honey Butter. Its texture can be better though. Truffle fries or cheese fries are aplenty everywhere, but if your sweet tooth is craving for some savory sweetness, Honey Butter Fries is the way to go! Cali Café has their fries deep-fried before tossing it in a honey and butter sauce. Certainly an interesting deviation from the usual fries variants. Dangerously addictive. Opened since May 2015, Density is the first-ever Frozen Custard store in Singapore! Could they be the first to launch honey butter ice cream in Singapore too? This velvety-smooth, luscious and creamy super premium ice-cream is made freshly on-site using only the best natural ingredients and integrates as little air as possible to achieve superior texture and mouthfeel. Just a spoonful is enough to prove what's being said is all true. Their honey butter flavor is more honey than butter, more soul than Seoul, perhaps a reflection of the time where the owner spent a few years in US and the frozen custard's origins. Another breakfast offering from Swensen's, this time with pancakes spread with a delicious dollop of honey butter cream. A combination of seaweed and almonds in honey butter flavor? The contrasting flavors and textures actually works! Besides their delicate as snowflakes bingsu, the signature toasts are another popular item on Nunsongyee's menu. Love the warm, crisp toast that's slathered with butter and honey, and wonderfully contrasted with cold creaminess of vanilla ice cream. Those pieces of chewy rice cakes sandwiched between the toast were quite a surprise too. The aroma of the freshly-made waffle was highly pleasing when it arrived at my table. Texture of the waffle was crisp and nice, but I thought the drizzle of honey butter sauce can be more generous. Should have asked for more!